Picture taken at Grant Park Farmers Market, one of the five Community markets. Atlanta is my hometown, and growing up in the surrounding suburbs, I know the anticipatory feeling you get once you enter city limits. Atlanta has a bit of it all- the bustle (aka traffic), the big city feel, and a diverse population. We roll into the holiday season with Atlanta’s Community Farmers Markets taking over our Guest Instagram account. Community Farmers Markets, made up of 6 markets, spread themselves in and among Atlantans to cater to their neighborhoods. Founded in 2011, CFM has become the cornerstone of local food community in Atlanta, thanks to local food leaders and interested stakeholders looking to strengthen food access. Deliberate and purposeful partnerships, existing desire to bring meaning to the local food system and a platform for collaboration make the Community Farmers Markets flourish with activity. Be sure to “attend” their markets these next two weeks on Instagram! Bang Tran: Community Farmers Markets was founded in 2011 by leaders in the local food movement in Atlanta, GA to meet the demand for more efficiently-managed, community-based, sustainable farmers markets. These stakeholders included farmers and local leaders who worked for a more vibrant local food system and who have special interest, talents, or resources to build a stronger local food movement. CFM serves as an umbrella organization with community-level “Market Community Groups” (MCGs) for each market that maintain the identity and culture of each market. CFM is a registered 501(c)3 nonprofit organization. Our markets offer seasonal, local produce as well as all the staples needed: breads, eggs, meats, and even Georgia caught shrimp! All of our vendors are within 180 miles of our markets, with the vast majority of producers within 50 miles. Some of our farmers even farm right in the city of Atlanta! BT: We manage five outdoor markets: Decatur, East Atlanta Village, Grant Park, Ponce City, and Westside. East Atlanta, Grant Park, Ponce City, and Westside are all located in neighborhoods of Atlanta, while we serve the downtown Decatur with our Decatur Farmers Market. Each market has its own personality and quirks, because every community is different. We strive to have unique personalities that work well with the surrounding community with each of our markets. Our Decatur market is open on Wednesdays year-round, and Saturdays for the regular April–December season. All of our other markets operate from April–December. In partnership with other Atlanta food organizations and MARTA (Atlanta’s rail system), we help manage the Fresh MARTA Markets, which are farm stands that bring fresh produce to the train stations, making it simple and convenient for people to get fresh fruits and vegetables on their way home. And, just like all our other markets, we double SNAP benefits to make it more affordable for everyone. BT: At all of our markets, we consistently have cooking demonstrations from local restaurant chefs and educational chefs, providing free samples and showing our shoppers ways to cook their seasonal produce. We generally have live music from local musicians, activities for kids from local community organizations, and at all of our markets, we not only accept SNAP/WIC benefits but also double them through a partnership with Wholesome Wave Georgia. BT: We are active on social media (Facebook and Instagram), have recurring highlights of the farmers markets and our farmers through a partnership with local papers. Of course, signage is always important, especially permanent signage that people can see easily as they drive or walk past. Paid Facebook ads can pay themselves easily, whether it’s to bring in new vendors or boost event attendance, we’ve had pretty good success with FB ads. It’s all about creating a custom audience that’s tailored to your specific markets, though, but once you figure that out, it’s simple. Outreach is also important, because the more you can create meaningful experiences for people outside of the farmers market hours, the more people will remember your market as a cornerstone of their neighborhood and community. BT: Our community is the most special part of our markets! A few of our markets have been around for over ten years, and we’ve seen so many businesses and farms outgrow the market. Ultimately, that’s the goal for our markets: to serve as low-cost incubators for our local growers and producers. Many vendors have opened brick and mortar stores and many farmers have scaled up their operations or moved on. The best thing is that many of those who outgrew the market still regularly support the market, whether it’s continued vending or just stopping by, it’s always special for us to have these long-lasting relationships. Every year, at our East Atlanta market, we host a free community potluck. Farmers, vendors, chefs, and community members all come out for a candlelit potluck dinner to celebrate the neighborhood as market season comes to a close. It’s one of our most special events. 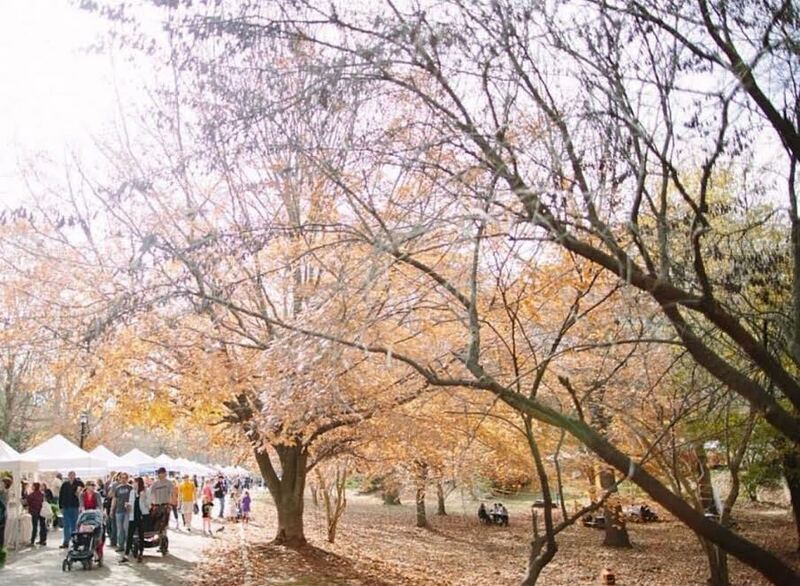 BT: We recently celebrated eleven years at our East Atlanta Village Farmers Market! This market has moved from tiny parking lot to tiny parking lot, until recently we were able to secure a space and transform it into a community gathering area. Our market is still in the heart of East Atlanta Village, but now we’ve got a learning garden, plenty of grass and benches, and infrastructure to make load-in and load-out easier!